Skincare can be complicated. There are countless ingredients to keep track of, limitless products on the market, and the rules of application can vary drastically by category and skin type. Eyes in particular are a gray area: the skin around them is super sensitive, making it typically one of the first facial features to show signs of aging. These signs could include everything from wrinkles, dryness, and puffiness to hyperpigmentation, redness, and even a condition called blepharitis (which causes inflammation of the eyelid, particularly near the lash line). This makes it even more important to treat the area with care and use specially designed products for around the eyes. Eye creams exists in a completely separate category from other face creams for a reason: because the skin around the eyes varies in thickness. “The skin above the eyes [our lids] has greater mobility and is thicker and more resilient to allow for movement,” says Dr. Julie Russak of the Russak Dermatology Clinic in NYC. Beneath the eyes, the skin is the thinnest of all the skin on our body. Its purpose is to cover the tiny fat pads that exist to protect our eyeballs from injury. Because the skin around our eyes is so thin, heavier creams are more likely over time to cause drooping and sagging. Think of it like placing a rock on a taut piece of delicate fabric — after a while, the material won’t be able to bounce back the way that it used to. That’s why Russak recommends using a lightweight firming cream on both the upper and lower eye areas. You won’t get heaviness that can weigh on skin and it’ll help firm up any early signs of sagging. One of our favorites is the Algenist® Complete Eye Renewal Balm ($68), particularly because it’s infused with caffeine. This ingredient helps to tighten and lift the look of the area, making you appear more awake. However, while this formula can be used on both the lid and beneath the eye, not all formulas should be. Though the skin on your lid is thicker, it’s especially vulnerable because when that area is weighed down, it droops. (And inevitably, that could interact with your vision, so be careful!) Avoid applying products with heavy ingredients, such as cholesterol and peptides with muscle-relaxing effects, to this area, restricting their use to your undereyes only. 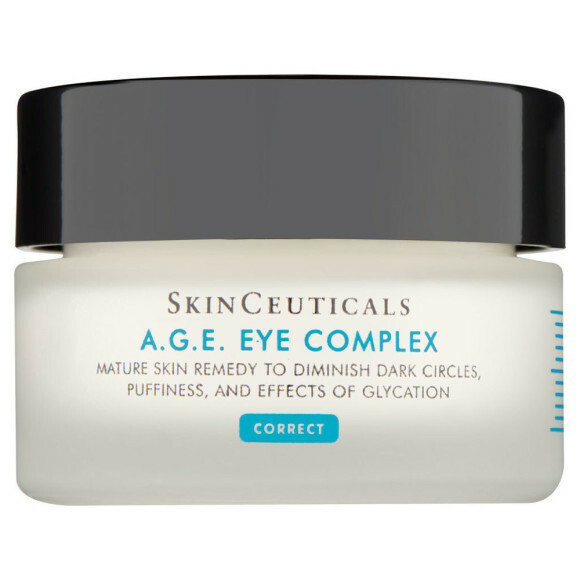 One of our favorite products for specifically beneath the eye is SkinCeuticals® A.G.E. Complex ($98). It features blueberry extract and peptides to help improve the dark circles and puffiness that becomes more of an issue as we begin to lose fat in the area. But if it’s fine lines under the eye that you want to tackle, try a skincare fix that Russak recommends regularly to her patients: Revision Skincare® Revox™ 7 ($130). It’s formulated with those aforementioned muscle-relaxing peptides (so only use it below the eyes!) to help smooth away crepiness. Ingredients are critical not just because of the anti-aging benefits, but also the adverse reactions that can result if you choose the wrong ones. “The upper eyelid rests over the eyeball, so chemicals might penetrate and cause issues,” warns Dr. Ellen Marmur, NYC dermatologist and founder and CEO of Marmur MedicalSM. Because of that, she says to avoid brighteners like hydroquinones or tranexamic acid on the upper lid when possible. Parabens (a preservative found in many skincare products), retinoids of any kind, and cortisone should also never be applied to the eye area. Heed our warning: parabens can cause sensitivity, retinoids can lead to dry eye and irritation, and cortisone can cause premature cataracts (yikes). Once you’ve found your new favorite formulas, apply your treatments generously — but gently — all the way around the eye in the shape of a donut. Use your ring finger, as it’s the weakest, so you won’t find yourself rubbing and tugging too much at the thin skin. “Rubbing the eyelid skin, a very entrenched habit, can create hyper-wrinkled skin and hyperpigmentation called lichenification,” says Marmur. Lichenification makes the skin look thick, leathery, and often scaly in patches, so lightly smoothing and tapping your cream on is key. But no matter where you fall on the “eye chart,” know that it’s never too late to put an anti-aging plan in place. Marmur suggests always wearing big sunglasses, since sun damage dissolves the collagen in our skin. You should also always take off your mascara with gentle makeup remover — find our favorites here! — and moisturize nightly. To score a few bonus points, adhere to a few more challenging tips of Marmur’s: “Get enough rest, avoid excess salts (soy sauce is not your friend), and excess alcohol.” Coupled with your favorite eye cream, you just might wake up to brighter, younger-looking eyes.